When I saw Sarah from Catching The Magic post to Facebook that she was reading this book via the Kindle iPhone app I was intrigued. Even just the title of the book plus the picture of the wee boy on the front on the Facebook link was somehow drawing me in. (You can also read Sarah's review of the book here). So I looked it up on Amazon and thus my first ever Kindle experience reading a whole book via iPhone began. This is the true story of the four-year old son of a small town Nebraska pastor who during emergency surgery slips from consciousness and enters Heaven. Despite what you might personally believe about the ways in which people get to Heaven, this book is engaging at so many levels. I think anyone who read it would be hard pressed to challenge the validity of this experience being 'for real'. From the outset, I also loved that I could identify with what goes on in the mind of a 4-year old as I have one of those in my own household right now *smiles*. 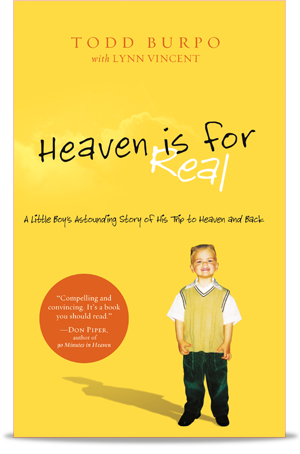 Colton's experience of Heaven is as a result of leaving his physical body on the operating table while undergoing lifesaving surgery after his appendix ruptures. Over the course of the next few years, at various times, he shares with his family the details of his time with Jesus, meeting people straight from the pages of the Bible, and describing the reality of Heaven with the clarity and innocence of a young child. Despite his parents being pastors with a strong faith in God, even they start out completely skeptical that what Colton is telling them is 'for real' because it just seems so fantastical. But no matter how much they try to 'test' him (in a nice way of course) his story ALWAYS measures up against the very words out of the Bible about what Heaven and Jesus will be like. But............what blew me away the most (and it is what makes this book not just another nice 'story') is the personal encounters he has with family members in Heaven he had never met on Earth. He never knew his baby sister who had been miscarried before he was born and who his parents hadn't even told him about. And yet he met her in Heaven. And his great-grandfather who died some 30 years before he was born. He also describes the horse that only Jesus could ride, about how "reaaally big" God and his chair are, and how the Holy Spirit "shoots down power" from heaven to help us. But I'll stop there as I don't want to give too much away and spoil the lovely moments of the book because I really hope you will take the opportunity to read it for yourself. I wholeheartedly believe in the truths contained in this book. Despite never seeing these things for myself, I choose to believe. For me it's a matter of FAITH. Knowing it in my knower. Prepare to laugh, prepare to cry, but be prepared to BELIEVE. Whether it is to reconfirm truths you already know deep within, whether it reconfirms what you once knew but had forgotten, or whether it is to believe for the first time, be ready. I'm giving one lucky reader the opportunity to win a copy of this book in the next few days, so stay tuned! I've heard heaps about this book and it sounds amazing!! That book sounds fantastic. Now to go and get it for myself.